An unmanned half-mile long train barrels towards a city as an engineer and conductor race to stop the train and prevent catastrophe. The last film of Tony Scott’s I can remember enjoying was 2004’s Man on Fire. This is easily his best film since Enemy of the State and his most intense. The film is carried by its fantastic cast and unrelenting tension, which works well for Scott’s way of filmmaking. Unstoppable gives us two lead characters the audience can truly care for, thanks to the two amiable leads. Denzel Washington is effective as usual, not having much to work with but doing the job that needs to be done. Chris Pine (Star Trek) is the highlight here as he gives the most charismatic performance and is the film’s most intriguing character. Rosario Dawson does nothing but sit in a room and talk into long distance walkie talkies…but like the rest of the cast, she does the best with what she has to work with. This is not the typical action film; there is no “villain”, there are no shootouts or fight scenes or car chases. The tension is easily derived from what is at stake and how “unstoppable” a freight train like this truly is. After the first 20 to 30 minutes of the film, it is a non-stop thriller that may literally leave you breathless when it comes to an end. 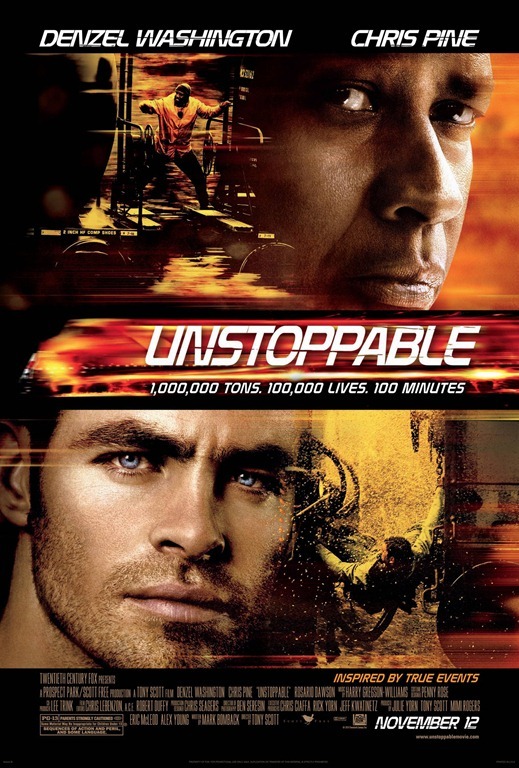 Unstoppable is Tony Scott’s best film in years and is one of the most effective action movies that truly delivers on tension. With a couple of great leads, some slick direction, and quick pacing, this is a great time at the movies.